RKA Consulting Group provided professional engineering services for the Main Street Improvement Plan Project in the City of Carson, California. The project involved the design, construction administration, and construction management of approximately 1.5 miles of street reconstruction. Main Street is a major arterial through the City of Carson, which services several large businesses throughout the day and evening hours. 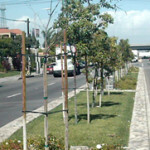 The new street design included full street reconstruction, median installation, and parkway improvements. A major challenge that was encountered during construction was the uncovering of the original P.C.C. pavement along the center of the street (approximately 20’ wide). Previous pavement rehabilitation projects did not remove the existing concrete and investigations for this project did not identify it. Design modifications had to be made during the construction to accommodate the unforeseen conditions and were done so with minimal impact to the project. 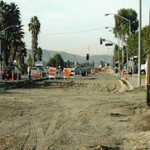 RKA Consulting Group provided professional engineering services for the design of approximately one mile of road reconstruction and widening, including median design, for the Valley Boulevard Street Rehabilitation Project in the City of Walnut, California. The success of this project relied heavily upon effective project coordination by RKA between three separate agencies -the City of Walnut, the City of Industry, and the County of Los Angeles. The project consisted of the removal and replacement of existing asphalt concrete pavement and construction of center median, curb, gutter, sidewalk, bus turnouts, and traffic signal improvements. RKA also provided construction management and contract administration throughout the completion of the project.